As a traveler I would dispute that statement. As a writer I was impressed, and I quickly looked into who this writer of writers, Orhan Pamuk, was. Good writing takes you places. 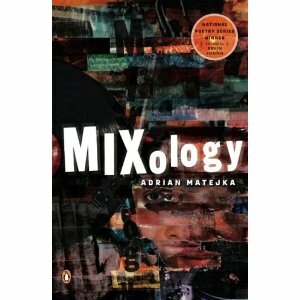 Adrian Matejka, author of Mixology, winner of the National Poetry Series 2008 (USA), takes you into his life as a mixed-race man. As a mixed-race person myself, I felt at home. Do The Right Thing, a poem about Matejka meeting famed Black director Spike Lee, is a punch in the gut. If you know film the name attracts you. If you know of Spike Lee, you know he’s intense. In Do The Right Thing (the poem) Lee does nothing but wrong! Why you care? You ain’t even black. An expo goer follows by saying, Damn Spike, that ain’t right. You’re never enough as a mixed-race person. One group says you look more like this, another group says you sound more like that, all groups bounce your identity around like a pinball in a never-ending game. As a person who on many occasions has not been Arab enough, South American enough, Indigenous enough, Chinese enough, Matejka had me freeze like pressing pause on a Michael Jordan highlight. Book in hand, lungs in my throat, eyes glued to Lee’s words, Matejka took me to the Black Expo and back to memories of being surrounded by ‘my peoples’ in different settings—those “you ain’t even” settings. Matejka’s clever word-play in the choice of his title couldn’t have been done better. The poet starts with Lee being surrounded by fans; he includes the title of the poem as the title of the film, “Fresh off seeing Do The Right Thing”; he shows his strength via challenging an icon; and he shows the weakness in Lee’s attempt to uphold status via tearing down Matejka’s identity. Do The Right Thing is a brave poem, and bravery is often needed when doing what’s right. Two lines too long of being a sonnet, Matejka’s song of pain is felt every time I read it. The first time my eyes absorbed Matejka’s words I was KO’d by a punch I didn’t see. Now, as I read Matejka’s poem over and over (countless times in the two years I’ve owned Mixology), every couplet is a jab leading to the final blow that lays me flat. 2. Being of color in Texas is to wake stressed from being. 3. Bad to be black, worse to be a mixed indetermination. 4. In Texas, cornrows are landscaping. Each line can be the subject for an essay. Each line represents past, present, and future. Each line is a sad truth. Matejka mixes music (Blues, Hip Hop, Rock and Roll), politics, race, and identity. Mixology is a cocktail that is bitter sweet; a song you replay even though it brings tears to your eyes; a book you want to tear up but can’t put down. Today, I’m assimilating like margarine into hotcakes. Tune into Black Coffee Poet Wednesday February 22, 2012 for an inclusive interview with Adrian Matejka. This entry was posted in Poetry and tagged "Do The Right Thing" by Adrian Matejka, "Mixology" by Adrian Matejka, Adrian Matejka, Black Coffee Poet, https://blackcoffeepoet.com/, Jorge Antonio Vallejos, mixed race identity, Mixed Race Man, Mixed Race poetry, Mixed Race Politics, Orhan Pamuk, Spike Lee. Bookmark the permalink.